Please click here to sell your Milford Zornes painting or receive a free art evaluation of your piece. Click to review some of the paintings we've recently purchased by Milford Zornes. 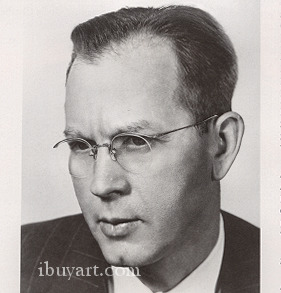 Milford Zornes (1909-2008) Born: Camargo, OK. Member: National Academy of Design, Amercian Watercolor Society, California Water Color Society. By 1933, Milford Zornes was exhibiting his watercolors and receiving awards. As a result of his art production for the P.W.A.P. art Project, he was given a one-man show at the Corocan Gallery of Art in Washington, D.C. One of his watercolors was selected by President and Mrs. Franklin D. Roosevelt to hang in the White House and an enormous amount of publicity followed. 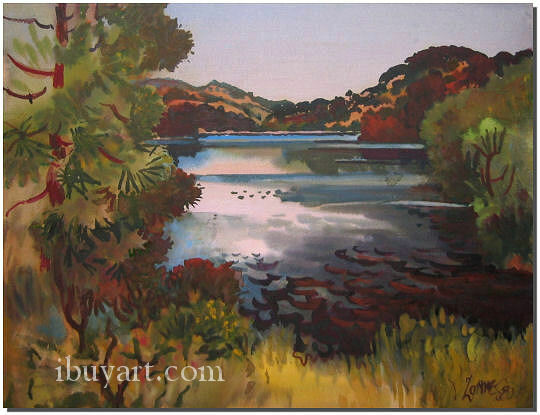 Within a very short amount of time, Zornes went from being a California watercolor student to being a nationally recognized artist. Over the next few years, Milford concentrated on painting a number of high quality watercolors for exhibitions in Califonnia, Texas, Washington, D.C., Ohio, Kansas, New York, Illinois and other parts of America. 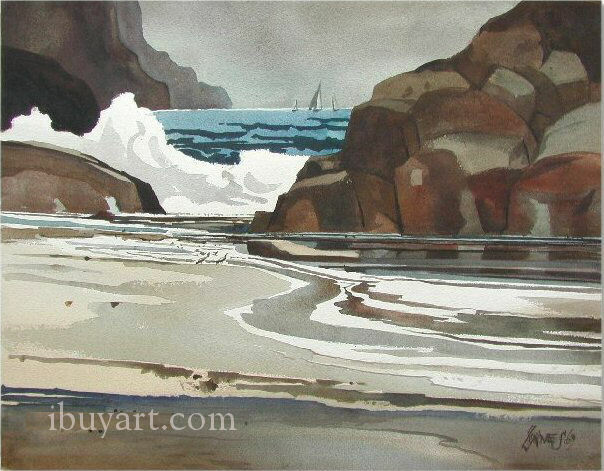 When Larson P. Cooper formed the California Group traveling show in 1937, Zornes was one of the twelve artists picked to represent California watercolor painting. 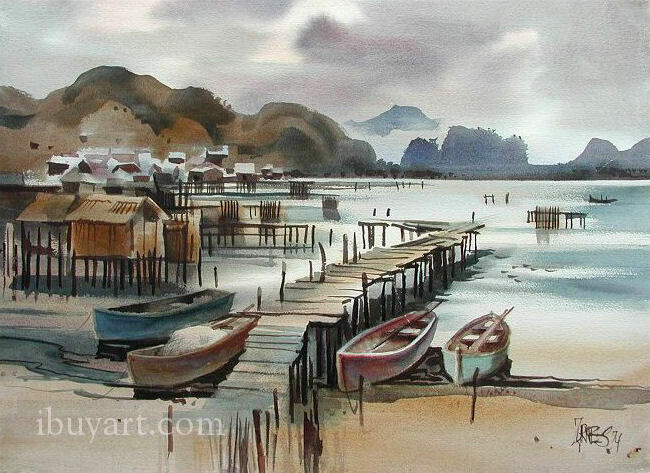 On the West Coast, he also became known as a gifted instructor of watercolor painting. Throughout this period, Zornes was an active member of the California Water Color Society and was president of that organization in 1942. When World War II broke out, he was drafted into the United States Army and was assigned to be an official war artist in the China, India, Burma theatre. For nearly three years, Milford painted on location in those countries and turned most of the art over to the War Department art collection housed at the Pentagon. He also had an art show in Bombay during this time. After the war, Zornes moved around California for a while, and eventully settled in Claremont. From there, he took a trip to Alaska and a series of trips to Greenland. All the while he was painting, teaching, and exhibiting nationally. Gradually, he developed the idea of traveling watercolor workshops. This combined his favorite things to do; travel, paint watercolors, and help others to enjoy the same. Zornes became one of the finest watercolor instructors in America and has been to nearly every part of the world at one time or another. In addition to painting and teaching, Milford has worked as a mural artist, authored a book about his art and travels in Nicaragua, produced fine art prints, and was the subject of a book, which he co-authored, titled MILFORD ZORNES published ny Hillcrest Press, Inc. in 1991. Milford Zornes biography posted with permission of �California Watercolors 1850-1970� by Gordon T. McClelland and Jay T. Last. Copyright Hillcrest Press, Inc. 2002.